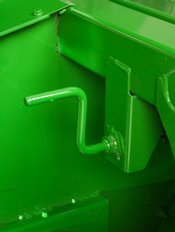 For added convenience, the hitch pin retaining bracket can also be used to store the power take-off (PTO) shaft when the machine is not attached to the tractor. An overrunning clutch is located near the platform gearcase on all models. 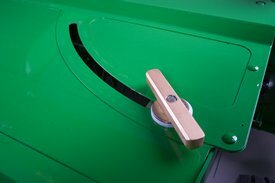 This design enables free rotation of the tractor hookup to make attachment to the tractor easier. On 540-rpm machines (optional on the 630 model only), a slip clutch is incorporated into the overrunning clutch to provide protection to the platform. No clutch is required on 1000-rpm machines due to the reduced torque loads. 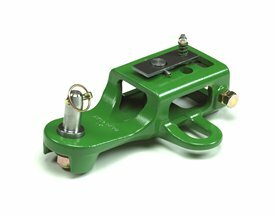 The drawbar equal-angle hitch is designed to be towed by a tractor only and includes a screw jack and safety chain. 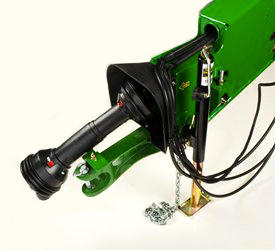 The swivel hitch is available in a 1000-rpm power take-off (PTO) only. 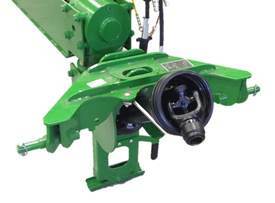 It attaches to the lower lift arms of a Category 2 or 3N 3-point hitch with or without quick-hitch. The parking stand allows quick and easy hookup. 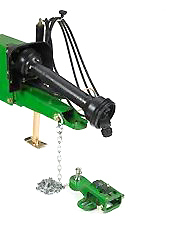 A down stop chain is also included which limits the travel of the rockshaft to help prevent implement driveline damage. Cutting disks are made of high-strength, austempered steel to ensure the steel is thoroughly and evenly tempered for good wear characteristics. Made of austempered, heat-treated, ductile steel for excellent wear characteristics, wear caps are installed on each end of the cutting disks (except on the end disks where crop accelerators are used) to increase the wear life of the cutting disks and knife-bolt nuts. Made of high-strength, nodular iron castings, each module consists of two idler gears and one drive gear. The large-diameter idler gears transmit power from module to module. The idler gears turn at a relatively slow speed for added durability. The impeller conditioner works well in legumes, especially alfalfa and most all-grass crops. Impeller conditioners are not recommended for thick-stemmed or cane-type crops, such as sudan or sudex, or crops over 1.5 m (5 ft) tall. 33 V-shaped tines are on the 625 Mower-Conditioner; 45 V-shaped tines are on the 630 and 830 Mower-Conditioners; and 57 V-shaped tines are on the 635 and 835 Mower-Conditioners. Scuffing action removes the waxy surface from the stem of the plant to allow for faster evaporation of moisture. The conditioner hood opening is adjustable to accommodate various crop volumes. The crank handle allows an infinite number of adjustments between the minimum and maximum conditioning levels. The closer the hood is to the tines, the more aggressive the conditioning. 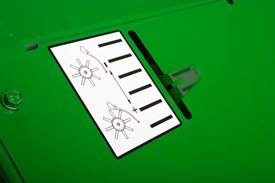 A conditioner position indicator provides an easy reference point to control the degree of conditioning. In general, roll conditioners are better suited for thick-stemmed, cane-type crops and crops more than 1.5 m (5 ft) tall. 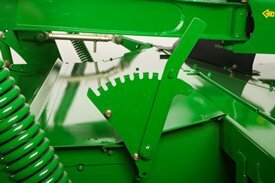 A swathboard is in base equipment for additional control of the windrow formation (for 630 and 635 Mower-Conditioner models only). The V10 steel conditioner rolls feature 10 angled flutes arranged in a chevron pattern, or V-pattern, along the length of the steel core. When equipped with an impeller conditioner, the kit consists of a redesigned, base swath board and four (3.0-m [9.8-ft]) or six (3.5-m [11.5-ft]) steel vanes bolted to the bottom of the swath board. 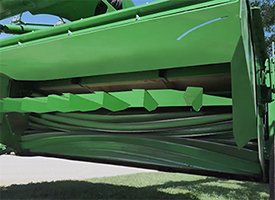 On roll conditioner machines, the kit also comes with a redesigned, base swath board but has six (3.0-m [9.8-ft]) or eight (3.5-m [11.5-ft]) steel vanes. *Three year Cutterbar warranty covers internal drive components on 600 and 800 Series Mower Conditions. See the CUTTERBAR LIMITED WARRANTY at dealer for details.